The fly-on-the-wall insider account is a hallmark of sports literature, and when the subjects are open and engaging and on-field happenings dramatic and captivating (think A Season on the Brink and more recently Collision Low Crossers) these books can be some of the best of genre. Long-distance running, more spectator-unfriendly than most other non-Curling sporting activities and beset by slim literary pickings once fictional (the John L Parker novels are decent but always dragged for me when Quentin wasn't running) and instructional (Lore of Running and Daniels' Running Formula are essential training guides but not exactly beach reads) fare are excluded, has never been subject to the insect-atop-plaster treatment. This changes on October 27th, a little less than a week before this year's New York City Marathon, with Ed Caesar's Two Hours, a much-needed book that finally addresses the gap. Two Hours peels back the curtain on elite Kenyan runners and their training through three years of reporting and extensive interviews. Primarily centered around 2011 Boston Marathon champion Geoffrey Mutai, Caesar offers a peek into the life of an elite Kenyan marathoner and what it is like to subject oneself to running an elite marathon time (spoiler alert: turns out it's rather unpleasant). Many people may see the winners of big-money marathons as a revolving door of genetically-gifted Kenyans with amusing names and boring personalities (I'm sure that whole "English as a third/fourth language" thing doesn't help matters). Caesar does a phenomenal job at humanizing and making the reader care about Mutai, writing about how he channeled his restless drive to go from crushing rocks to form cement as an 18 year-old to traveling the world running marathons and becoming a millionaire in developed-world denominations (yet still spending most of his training time in a cramped house shared with other athletes without any electricity or running water). It's truly a fascinating look into the lives of top African marathoners with a level of detail that is, to my knowledge anyway, unprecedented. Two Hours offers more than just these insider accounts. 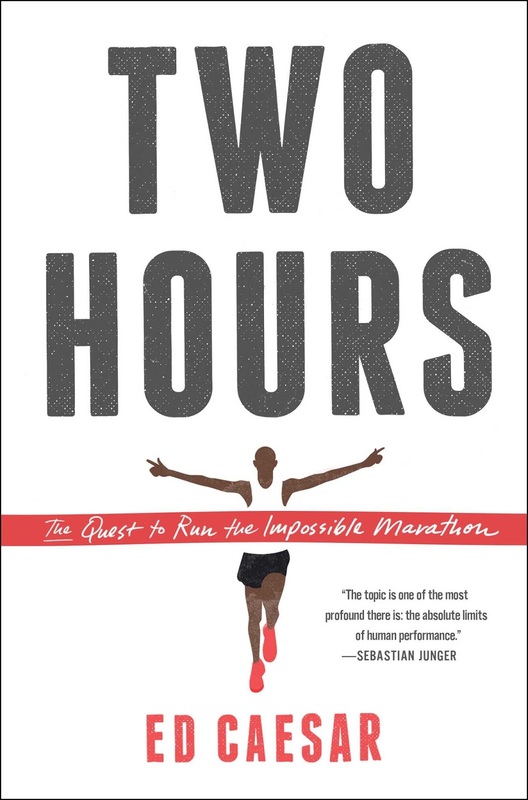 Its promotional blurb dubs it "the first major book about the marathon," and while PR departments are predisposed to immodesty and hyperbole, this is actually an accurate description. Caesar pursues a variety of detours into other aspects of marathon with Mutai's narrative serving as the major thread linking all the sections together. He chronicles the history of the marathon, profiling luminaries in the field ranging from Pheidippides to Emil Zatopek to Mutai and how humanity has managed to shave almost an hour from the top marathon time over the last century-and-a-half. There are also sections on performance enhancement and interviews with trainers and busted athletes and the science and genetics behind whether runners will ever break two hours in the marathon. Though topics such as the big business and complex logistics of putting on a major marathon aren't really touched upon and some readers may quibble with the fact that there are only a few fleeting mentions of female runners over the entire book, Caesar largely touches all the major bases around organized running events lasting 26.2 miles. Two Hours is somewhat deceivingly named because it is already clear to any current marathon fans (there are dozens of us!) that runners remain several years away from being capable of sniffing such a time (if they even ever can at all). Caesar makes this point evident to the reader pretty early in the book as well. Instead, Two Hours is largely about elite marathoners in general and Mutai specifically and recent attempts at pushing the record closer, but now below, 2 hours. Mutai himself primarily focuses is on the slower and rabbit-less New York Marathon when Caesar follows him. There is no nail-biting account of some penultimate event where a top marathoner tries to go sub-2:00, though there are extended discussions about the science behind it (which are mercifully laymen-friendly yet scientifically sound and very well-explained) and the optimal conditions for such a race (a special track that strikes a perfect balance between springy and firm, rabbits to pace and allow drafting, and only a few elites to avoid multiple parties throwing down surges). At its core, Two Hours is basically everything you wanted to know about the marathon rather than being limited just to running a time with a 1 in front of it. Caesar is a British author whose work has been featured in the likes of The New Yorker and New York Times Magazine. He is a gifted writer with a knack for lyrical and detailed prose on the act of running, adeptly describing each runner's unique gaits (including how Haile Gebreselassie had an awkward bend in his left elbow resulting from years of running carrying his schoolbooks) and the excitement of the surges and tactics of elites dueling in major marathons. I'm not sure whether Caesar is actually a runner or has any marathons under his belt (unsurprisingly he opted not to run alongside Mutai during his training sessions and instead used a motorcycle) but he writes with the same love for running and detail as the member of your local track club who gushes about the newest foam roller and spills seas of e-ink opining on the various merits of the different Garmin GPS watches. As a marathoner who loves to geek out on LetsRun and honestly would seriously consider bringing Lore of Running to the beach (assuming I could fit that Brobdingnagian tome in my beach bag without breaking it) I've been eager to read Two Hours since I saw the positive review it received in The Economist when the book was released in the UK this summer. I'm pleased to report that it exceeded my expectations and may likely go down as my favorite sports book released in 2015. 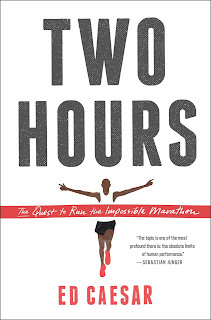 While depth is sometimes sacrificed for breadth, Two Hours is the best general-interest book on the marathon and a vital addition for any runner looking for an entertaining and comprehensive volume about long-distance running. I have tried to read everything I can get my hands on about running and marathoning, and I was still constantly learning new trivia tidbits (including how the pace clock for the lead pack stalled at an incorrect time during the 2012 Berlin Marathon and threw off runners' times, a thorough debunking of Pheidippides' claim to marathon trailblazing, and how the 1908 Olympic Marathon in London which standardized the 26.2 mile distance was actually found to be 174 yards short of 26.2 miles itself when re-measured roughly a century later, among many others) in addition to Caesar's in-depth examination into Mutai's life as an athlete. If you strictly prefer your ambulation with one foot always on the ground and don't understand all the hubbub around the marathon and its record times then you probably won't enjoy Two Hours. Given its subject matter I'm not sure Two Hours has the same crossover appeal as Chris McDougall's Born to Run which had a more extended and cohesive narrative and spearheaded an athletic shoe cushioning movement (that is actually somewhat debunked in Two Hours as many elites are now clamoring for firmer shoes with more cushioning and higher heel drops). That said, I can't recommend Two Hours strongly enough if you are even somewhat interested in participating in or following distance running as it is the best non-instructional book I've read on the topic.